Perhaps the single most effective way to prevent the possibility of early tooth decay in your child is to practice prevention, right from the very start. This means scheduling your child’s first dental visit right around his or her first birthday. 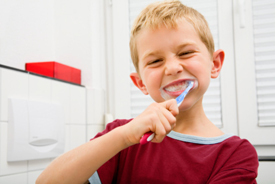 It’s never too soon to begin routine dental care! While tooth decay is on the decline for most age groups, it’s increasing in children aged two to five, and unnecessarily so, because it’s preventable in 90% of all cases with proper hygiene and regular dental care. The earlier, the better – sometime between the first tooth erupting and the first birthday is ideal! Prevention is your best weapon against tooth decay and healthy teeth are important to your child’s ability to speak and chew more easily, in addition to the self confidence that having a winning smile brings! Your child’s diet contributes to the likelihood that tooth decay will develop, especially if it’s one filled with sugar, carbohydrates, gummy snacks, carbonated beverages, fast food and candy. Supply your child with plenty of tooth-healthy snacks, such as fruits, vegetables, crackers, and cheese. Children who are all day bottle-suckers, or who take a bottle to bed with them, run a dramatically increased risk for developing tooth decay. Milk and juice that constantly pass through the mouth, or that lay in a pool in a sleeping child’s mouth, can cause rapid tooth decay. So… never put your baby to bed with a bottle unless it contains water and wean your child to a cup as close to the first birthday as possible. Fluoride is an essential ingredient to help strengthen developing teeth. It also helps to prevent tooth decay in older children. Most tap water is fluoridated, so if your child regularly drinks bottled water, please talk to us about your child’s fluoride needs. The best way to care for your baby’s new teeth is by being proactive – both with their daily hygiene and through routine dental examinations. The staff at Ian Barwick, DMD cares about your child’s teeth as much as you do, and we want to help them maintain healthy teeth and gums to last a lifetime. So please feel free to call us at Ian Barwick, DMD with any questions you might have, or to set up an appointment for your child’s dental examination. We’re here waiting for you!